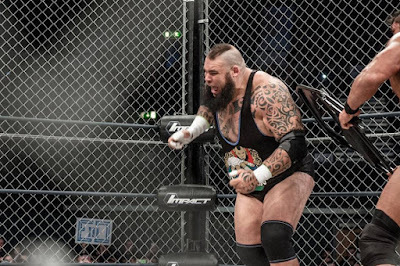 On 24th February 2016, the 606th episode of TNA's Impact Wrestling, subtitled Lockdown 2016, aired on POP TV from the SSE Arena in Wembley, London, England (Taped on 30th January 2016). 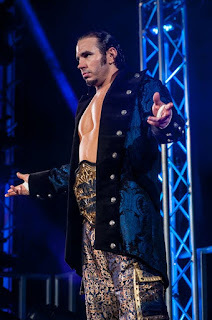 Ethan Carter III challenged Matt Hardy for the TNA World Heavyweight Championship inside a Steel Cage and Gail Kim, Velvet Sky and Maria teamed up to face the Dollhouse in the first women's Lethal Lockdown in history...but was it any good? Let's find out! The show kicked off with the grudge match between Bram & Eric Young and Beer Money. A solid start to the episode, featuring some quality brawling and working within a simple narrative. The crowd was hot from the start, with James Storm ending up "locked" outside the cage, as Bram and Young worked over Bobby Roode on the inside. 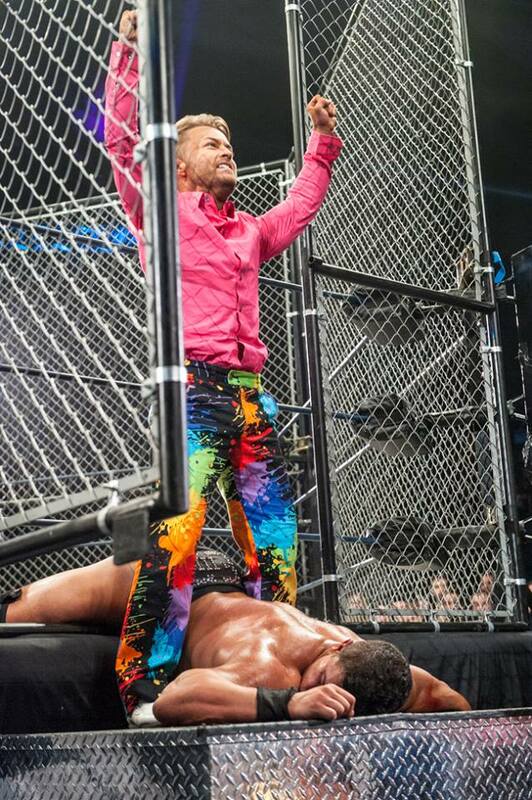 However, the crowd went nuts for Storm climbing over the top of the cage to attack the heels and stayed invested in the action for the rest of the clash. 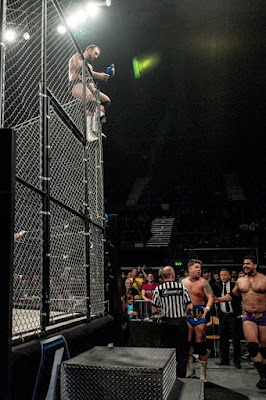 Whilst Beer Money were pretty dominant when both inside the cage, the heels got a decent near falls of an Elbow drop variation of the Death Sentence, before Roode & Storm claimed victory with the DWI. Perhaps two or three minutes could have been sliced off as it dragged just a little after the first DWI attempt was escaped by EY. Ethan Carter III is settling nicely into his new babyface roll, as he cut a promo about his upcoming steel cage match with Matt Hardy over the World Heavyweight Championship, whilst sitting on the steel steps outside the cage. With a quirky energy, EC3 made references to Elton John and more, before moving on to call out old pal and enemy, Rockstar Spud. Spud's promo was just as strong as EC3's as the former 2 time TNA X Division Champion agreed to let bygones be bygones, before they shook hands. After a quick reply from Matt Hardy (who bought out Tyrus & Reby Sky) the stage was set for their title bout later in the show, with the SSE Arena more than ready to see the two go at it. Personally, one these special shows, I'd much prefer things to remain all action, just to give things the PPV feel, I'd have enjoyed this much more if it had aired the week before the title match. I can't go any further without mentioning Tigre Uno's incredible dive off the top of the steel cage, It looked just as spectacular on TV as it did inside the arena and received a HUGE pop. I just wish the commentary team had made a hell of a lot more of the kick out by Trevor Lee following the move. However for me, the rest of the match was way, way too short. As the third bout of the feud, to only give the match just over six minutes seemed like a big waste of an opportunity, especially considering the duos previous matches have been around the same length. Neither man is particularly over with the fans yet, and needed a long competitive match to show exactly what they can do. 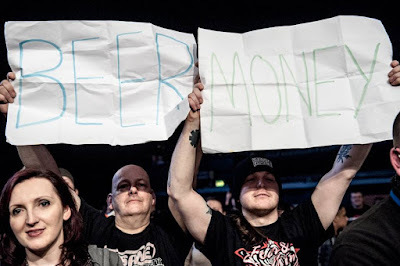 There's a lot of potential in Trevor Lee (who retained his title with a Small Package Driver) and TNA seems to be struggling to find the best way to present that at the moment. A real moment for the Knockout's here as they were performed in their first ever Lethal Lockdown match! It was a shame that there were only three girls on each team, but it's likely that plans for the match had to be changed due to Awesome Kong being sent home from the UK tour. The bout was simply booked, with the heels always having the numbers advantage, following a lovely series of action between Gail Kim and Jade to start. The faces got some nice shine each time they entered. Maria accepted Gail's offer to join the team, after Madison Rayne had been attacked earlier on by the Dollhouse backstage, bringing interesting development, breaking the pattern of the match, allowing for an different dynamic where Gail and Velvet had to really fight from underneath. The finishing sequence got the crowd back into the match, after they had seemingly dropped off following some weak looking weapon shots from the heels. Gail hitting Eat Defeat on Marti Belle, only for Jade to break up the pinfall and hit a wicked Package Piledriver on a steel chair for the win, was timed perfectly and allowed the heel group to look strong. Gail and Velvet will hardly be hurt by losing what was essentially a handicap bout. Some of the best booking for TNA's women's division in quite some time. With Kurt Angle pulling out a similarly crowd-pleasing prom to the one he used two weeks ago, we got some storyline progression in the feud between he and Lashley. With the former WWE United States Champion interrupting the Olympic Gold Medalist, this was the continuation of Lashley's slow-burn heel turn as he ripped into Angle for losing to Drew Galloway in Manchester on Impact Wrestling #604. A quality bit of build to their match, which had been given a little bit of extra spice than some of the other matches on the Farewell Tour. Not sure whether this segment should have been on this Lockdown special, for the same reasons I bought up in talking bit between EC3, Spud and Hardy earlier in the night. There was enough time taken up in those two segments to accommodate an extra cage match or even two shorter bouts. You don't often see a comedy cage match, but that's what we had here. Whether you liked this match or not has a lot to do with how much you want to see a blokes arse exposed for quite sometime. Yup, Eli Drake had his trunks pulled down, after Mahabali Shera had prevented Jessie Godderz getting involved on the outside. In between the japes, there was one truly impressive spot in here, as Great took an electric chair drop off the middle rope, after trying to climb over the top of the cage. Josh Matthews saying the feud reminded him of Kanye West and Taylor Swift was some of the most cringe-worthy pieces of commentary on TV anywhere, ever. Great once again won the bout thanks to losing his mask, as Drake managed to remove it, leaving Great to fall to floor and win the match by escape. The loss leaves Drake without a win on TV since he defeated Crimson in the World Title Series back in November 2015. Odarg the Great is 2-0. 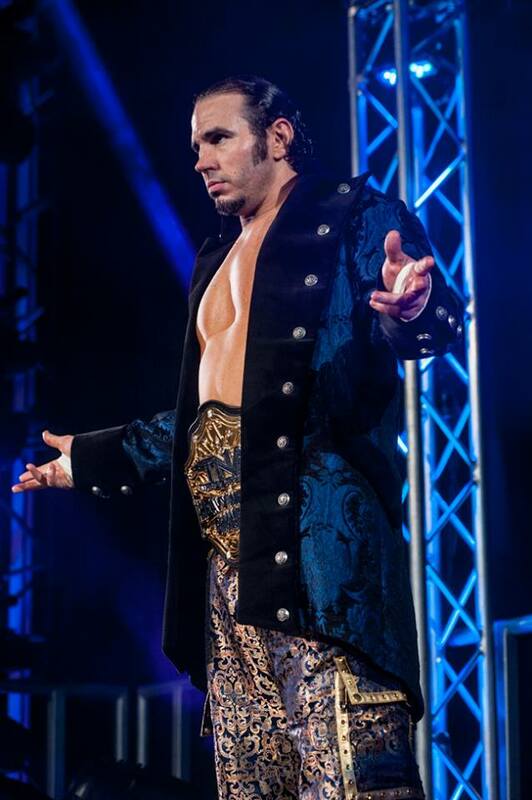 The feud between Matt Hardy (with Tyrus) and Ethan Carter III came to a peak as they faced each other in a dramatic steel cage match over Hardy's World Heavyweight Championship. The SSE Arena was hooked from start to finish, getting behind EC3 and pouring scorn on Hardy and his manager, Tyrus. Whilst the wrestling sections of the bout were a little off the pace, as Hardy seemed to struggle to keep up with EC3, as soon as the match got more violent and the stories of the match began to be pulled together it became a stellar contest. EC3 looked every inch of the top babyface that TNA needs him to be, as he kicked out of a number of Hardy's big moves, including a Twist of Fate with a steel chair wrapped around his neck, and continued to put on a great performance as he fought adversity managing to nuetralise the threat of Tyrus once the big man had entered the cage. With the drama escalating with Reby Sky charging down the ramp with the hammer (presumably the very same one she used to help Hardy win the title last month), only for Rockstar Spud to make the save to a big pop. But with EC3 making his way for the door, he got the cage door slammed right into his face...by SPUD! SWERVE CITY! 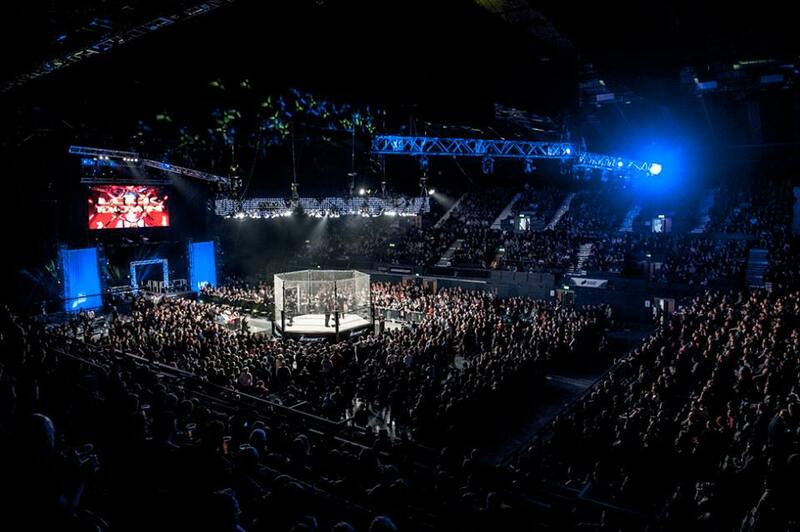 The crowd was in shock and dumped heat on Spud as Hardy walked out of the cage to retain his title! A great moment to close an entertaining World Heavyweight title bout, with everyone playing their parts well. A sound piece of booking that gave EC3 a new (or old) feud to move into straight away and keep him away from the World Heavyweight Championship picture for a while, whilst also allowing EC3 to remain unpinned or submitted. Plus, Hardy's title reign rolls on, after using a series of dirty tricks to try to gain the victory, he's becoming easier to hate by the minute and it's been a surprisingly entertaining five weeks with The Iconic One a top the TNA totem pole. This was not only the best episode of the UK tour to air so far, but also the strongest episode of Impact Wrestling to air in 2016. Both marquee matches on the show delivered quality television matches, as Matt Hardy and Ethan Carter III put on a fine storyline Steel Cage match over the TNA World Heavyweight Championship, with Rockstar Spud, Tyrus and Reby Sky all playing their parts well throughout what was the Match of the Night for me. The Women's Lethal Lockdown also used a lot of storytelling based elements to get the best out of it's six performers, providing avenues for new feuds and potential TNA Knockout's Championship opponents for Gail Kim. Personally, I think this type of show would be better off without the talking segments and if fans knew they were going to get a PPV style show (aka back to back matches) then they might be more likely to tune in. I ended up marking down the decent segment with Ethan Carter III, Rockstar Spud and Matt Hardy because it simply was needed before the Steel Cage match later on in the show, had it aired last week I would have been much more lenient on it. With Kurt Angle's Farewell Tour continuing next week against Bobby Roode and Drew Galloway facing off with Mike Bennett in a grudge match, let's hope that TNA can build on the momentum created here at Lockdown.